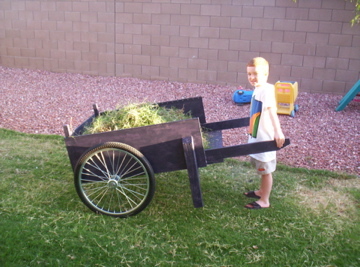 Caleb & I finished building our Whizbang Garden Cart and used it for the first time this morning. I decided to paint it with some left over exterior paint we had laying around. I had been, and may still be, hoping to paint some designs on it like an old hippie VW bus-van. The construction was fairly easy to follow, although at first I was following blindly until I figured out what was going on. It is very solidly constructed, well balanced, and I love the wheels. Unfortunately, I still live in the Valley of the Sun and my backyard is as agrarian of a setting as I can find at this point. In just a few short weeks, our Whizbang Garden Cart will be in the most agrarian of agrarian settings, when it makes it to our farm in Nebraska! I can’t wait — we are less than three weeks away! With just 44 days left until my last day at work, I am at a loss for things to do in preparation for the big move. We have almost worked out the choreography for our trip, including when I will take the pick-up to Nebraska, when the moving truck will come and go and when it needs to get to NE, when we will move out of our house and into a hotel for the moving days. We don’t want to go public with the days because our neighborhood is a bit prone to stealing, so we don’t want to take the chance that the 2-3 people who will look at this blog between now and then might know someone in our neighborhood. The transition has been moving slowly — I have changed the address on my resume to reflect the Sterling address. I am contemplating changing my phone number from a Phoenix number to a Nebraska number. Gina’s dad is planning to help out quite a bit with the move, which should be nice. 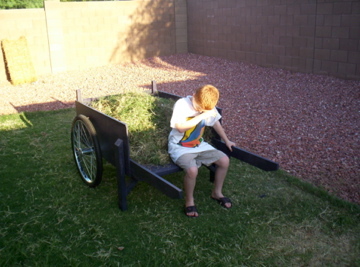 Yesterday, Caleb & I ‘finished’ putting together the Whizbang Garden Cart. It is now a functional cart. We still need to put the finishing touches on it, though, including a handle, and sanding, sealing, and staining it. It should be picture-ready before we leave! Caleb & I began assembling the cart this week. I still don’t have all the parts we need, but we have started putting the parts we have together. I put some J-bead over the top edges of the three vertical sheets of plywood. The J-bead I found did not have holes every inch, like that shown in Herrick’s book. I looked at Ace, Lowe’s, & Home Depot and couldn’t find J-bead with holes, so I just punched through the J-bead with a nail, then screwed through the nail-hole. Yesterday, Caleb & I reinforced the bottom piece by attaching 1x4s at crucial locations. This will keep the bottom piece of plywood from splintering when heavy loads are dumped in. The next step is to attach the legs to the side pieces. We are moving along slowly — slower than I wanted. But then, I rarely want to work in the garage when the garage temperature is 110°! Last night, we continued our work on the Whizbang Garden Cart by cutting up the one 2×4 and the four 1x4s. There were to be four rough cuts on the 2×4, so I had Caleb mark the locations for the cuts, then I cut the first two cuts using the power compound miter saw my wife gave me as a gift years ago. I then had Caleb cut the third cut and Meagan did the fourth cut. After that, the kids disappeared while I started working the 1×4 cuts. We completed all the straight cuts last night. I mentioned that the cuts on the 2×4 were just rough cuts; each of the 5 pieces we created need to be cut down further. All of the 2×4 boards need to be ripped to a narrower size, something I don’t know how to do without a table saw. I need to figure out a way to do this without a table saw or I need to find a table saw I can use, because there is no way I can work a table saw into the budget for this garden cart. Last night I also realized that the J-bead I picked up for this project does not have the holes every inch that it is supposed to have, so I am considering going back to Home Depot tonight to exchange the J-bead for what I need. In other news, we have been seeing and feeling the baby move in Gina’s tummy! She is at twenty weeks, so we are halfway. I looks like 11 September will be our last day in Phoenix and 11 November is the due date! Yesterday afternoon, in our 107° garage, Caleb & I began carving up the ½” sheet of plywood and drilling pilot holes for screws. Caleb was committed to working with me at first, but it wasn’t really child’s work as we used the circular saw to make some long cuts. I offered Caleb the chance to make the fifth and final cut, but he declined. We now have four pieces of plywood that will make up the bottom and three sides of the cart. The fourth side will remain open. Next we had to mark and drill the location of the pilot holes. I did the marking and Caleb did the drilling, at least for the first side. The front end of the cart got eleven holes, but the two sides each got 31 holes! The drill was too large for Caleb to handle alone, so I helped him, and I think that frustrated him because he wasn’t doing it himself. He asked to do it alone at one point, and I obliged, but it was too much for him. I tried to help as little as possible. It was after this first board of drilling that Caleb got distracted by his sister riding her bike around. He eventually went inside and I finished up the sides myself, including making at least two mistakes on the first side. On each side piece I was supposed to cut out a notch for the axle rod to go through that was ½” by 1″ — on the first side I made it ¾” by 1″ — hopefully not a big deal. The pilot holes, as they get drilled, are supposed to also be countersunk. But they aren’t all countersunk from the same side. I made a mistake on the first board and countersunk all holes from the same side, so I had to go back and I drilled new holes ½” lower and countersunk on the proper side — hopefully this won’t be a big deal, either. Tonight I think I will set up my power miter saw so Caleb & I can cut the 2×4 and 4-1x4s down to size. There is also some ripping that needs to be done; something I will have to do with the circular saw. And I believe there is also some pre-drilling and countersinking as well. This should definitely be enough work for us tonight. Last night, before the kids went to bed, I read another chapter of the Two Towers — the stairs of Cirith Ungol. They can’t wait until the book is done so they can watch the movie. Yesterday, Caleb & I went shopping for parts for the Whizbang Garden Cart. We found most of the parts, but we are still missing a handful, including the axle. I ordered the wheels from Northern Tool a couple weeks ago. One of the most important parts of starting any new project is to find some tool that I absolutely must have in order to complete the project. In this case, I picked up two 36″ clamps for $50, which brought our total shopping trip total to just over $150. Now I will have some big clamps for future projects. 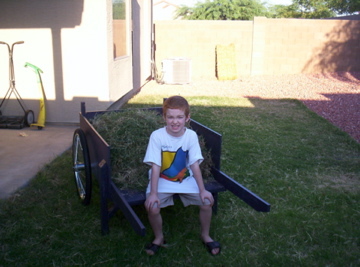 Caleb & I plan to spend some time this afternoon cutting wood, getting ready to assemble our garden cart. We want to have the cart completed by next Tuesday, when my Dad (“Opa”) comes to visit for a few days. Wow! We had another great weekend. On Friday, I skipped out of work a little early and we drove up to Holbrook, AZ, in the high desert above the Mogollon rim. We spent Friday night with some friends. On Saturday, we rose early and drove out to a real cattle ranch, where we worked cattle all morning. The ranch we were at was a conventional ranch, so there were some things they did that didn’t interest me too much, but at the same time it was all valuable experience. They had rounded up most of their herd and seperated out the cows from the calves. When we got there, they were just finishing ‘pouring’ the cows. Pouring the cows means pouring a blue liquid on their back that aids the cattle in staying free of lice, ticks, and other pests. After the cows were all done, we moved half of the calves into a pen and started moving them one by one into a chute where they would be caught, flipped on their side, and worked on. 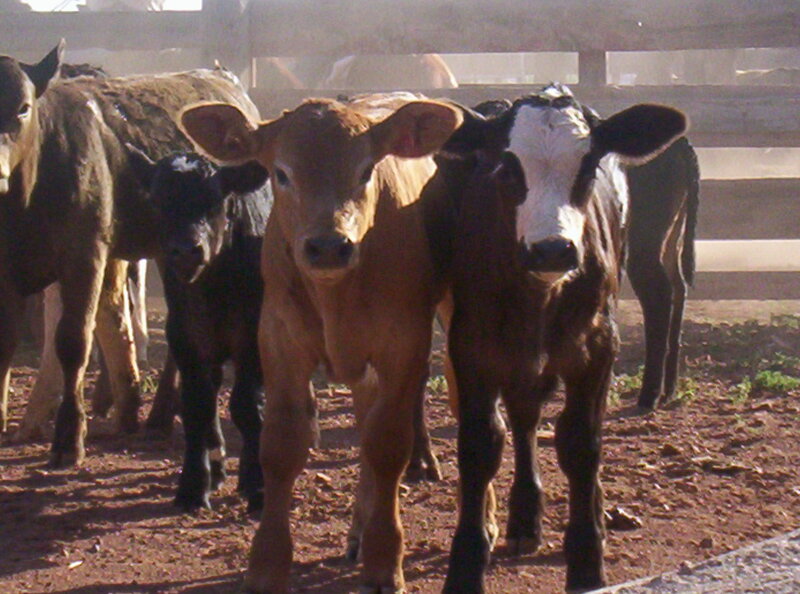 Each calf had to be branded, get two shots, and be de-horned, if necessary. They did not band the bulls because they said they have found that the bulls will put on an additional 50 pounds if they wait six months to convert the bulls into steers. The brand they use is HUGE. I felt sorry for the poor calves. The shots they got were one vitamin shot and one vaccination; the vitamin shot was intramuscular and the vaccine was subcutaneous. I gave the vitamin shot quite a few times, but the vaccine I only tried once. I also branded one of the calves, but I stayed away from the dehorning. The dehorning sent a stream of blood spraying out of a hole in the middle of the horn, which they would use a hot iron to cauterize. After the first half of calves, I moved into the pen with the second half of calves and practiced wrestling the calves. Most were my size or smaller, but a few were as big as twice my size. Basically, I would grab an ear with one hand, the tail with the other hand, and place my hip against the calf’s hip, so that the calf couldn’t kick me as easily. Then my job was to turn the calf until he was facing into the chute and twist his tail to make him want to walk into the chute where he would be caught and worked on. At one point during this fun, I had my back turned to a calf we called ‘crapper’ because his back was covered in manure (this was not a clean job). The other fella in with me was working on getting crapper to go into the chute. Apparently crapper got away from my co-worker and place his head right under my seat and lifted me off the ground and drove my head into a crossbar above. He only lifted me 6-12 inches, but it was enough. The only other injury I sustained was two of the calves stepped on my toes, which hurt but they didn’t turn black or fall off. After working cattle for a few hours (it felt like a full day’s work), we went back to the farmhouse for a big breakfast. Yummy! After breakfast, we went back out to the ranch, where we mounted horses and 4-wheelers and rode out to meet another 13 cows and 10 calves. We drove this small herd back into the sorting yard and seperated out the cows from their calves. We did the same work again, but at a much quicker pace. We also banded two bulls and they decided to keep one bull for the herd. I got to ride a horse again, this time totally unsupervised — and the horse liked to lope! I wish I knew better how to ride a horse. That afternoon, we slaughtered a laying hen and a rooster, scalded them using 140° water, and then I tried out my Whizbang Chicken Plucker, which I still need to show a picture of on my blog. The WBCP worked fabulously, removing almost all feathers within 15 seconds. The plucker worked better when both birds were spinning inside, rather than just one. One bird tended to get hung up, but with both birds when one would get stuck, the other would knock the first loose. I can’t wait to build my Whizbang Chicken Scalder, because that will make the whole process that much more efficient — scalding was very frustrating.